If you are retired, work from home, or can take your dog with you to work, one of our dogs might be a good choice for your home. Please use the links below to get to know us! Our dogs do not do well in households where no one is home. They need someone around most of the time. They love laps. They love walks, car rides and ANYTHING that involves being with their people. Whether it’s a night of watching TV by the couch, or a long run on the beach, as long as it involves being with their person or people, they are happy. If you are gone more than five hours a day on a regular (five-days-a-week) basis, you’re probably not a good match for one of our puppies. They are simply too people-oriented to spend that much time alone. 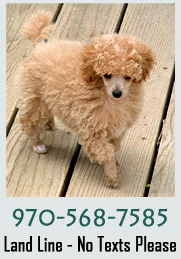 Powder Valley Poodles are what people desire in a dog. Healthy, temperamentally sound and easily trained dogs suitable for any family and adaptable to almost all households. Our dogs really are the best. Come talk to us and meet our dogs and you’ll see for yourself.